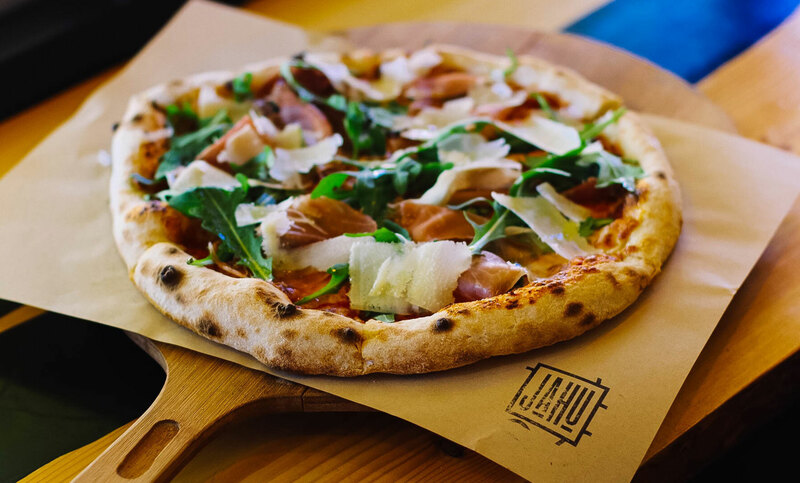 Prepared right in front of you and brought fresh from their ovens, this is not your typical pizza spot. Doubling as a bakery and delivering some of the finest scones and pastries in North Bay, Arizmendi also makes a serious pizza pie. Organic sourdough crust and whole-milk mozzarella? Yes, please. Try: The breakfast pizza with eggs and hashbrowns, only served on Sundays from 10-11am. The best part about Bare Knuckle Pizza is that their menu is constantly changing, and they’re not afraid to experiment with new combinations. Known for their gluten-free crust and vegan options, it’s a great place to bring even the pickiest pizza eater. Try: The David Mack with fresh mozzarella, prosciutto, pepperoni, basil, and a drizzle of olive oil. There is no shortage of excellent pizza places in North Beach, the Little Italy of San Francisco. Tony’s award-winning pizza is authentic Neapolitan pizza, straight from the heart of Naples. Come for the pizza, and stay for the Italian wines, handcrafted desserts, and you guessed it – more pizza. Try: The Cal Italia topped with asiago, gorgonzola, mozzarella, fig preserve and balsamic before cooked in a domed gas brick oven at 650 degrees. Golden Boy Pizza specializes in pizza by the slice and serves up classic favorites. Instead of your standard crust, they instead pile their toppings on fresh baked, delicious focaccia. Keep in mind they are cash only, so make sure you reach into your piggy bank. Try: The Clam & Garlic pie, a San Francisco favorite. Focusing on wood-fired pizza and small plates, be prepared for a bit of a wait at the door. Vesta is all about food bringing people together for conversation and community. They also have a serious wine menu – the perfect pairing for a hot pie fresh from the oven. Try: The Rosemary Potato and Bacon with a fresh farm egg on top. This is probably one of the only pizza places on the Peninsula where you can find true, authentic Chicago-style pizza. Thick, buttery crust with toppings piled high, it doesn’t get much better than this. Try: The Chicago Chop, a seasoned blend of chopped pepperoni, sausage, bacon, and salami with fresh mozzarella, marinara sauce, and crushed red pepper. Tucked away in San Pedro Market, Pizza Bocca Lupo is a hidden gem. Specializing in creating hand stretched, artisan pizza’s made to order, your dream pizza is at your fingertips. Swing by at lunch for ½ pizza, ½ salad, and a very happy stomach for $7.50. Try: For the cheese lovers, take a bite of the Quattro Formaggi featuring four types of cheese, juicy cherry tomatoes, and fresh basil. Having just undergone a serious renovation, Pizza Antica is the perfect cozy spot to enjoy an artisan pie. The open kitchen gives you a peek behind the curtain at the pizza cooking away in the open ovens. On a sunny day, snag a spot on the patio and people watch as you eat. Try: The Crushed Potato Pizza with fresh ricotta, arugula, and lemon. Monday through Friday, lunch or dinner (and sometimes even breakfast), pizza truly is one of the best meals out there. Celebrate #NationalPizzaDay by trying out a new pizza spot right in your backyard, and share your finds by tagging us in your social shares @prometheus_apartments.